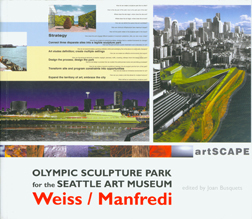 The Harvard University Graduate School of Design awards the Veronica Rudge Green Prize in Urban Design to recognize urban design excellence through projects that contribute to the public realm of the city and improve the overall quality of life.As the ninth recipient of the Green Prize, the Seattle Art Museums Olympic Sculpture Park, designed by the firm ofWeiss/Manfredi, impressively achieves both goals. The design provides a strikingly beautiful (yet distinctly urban) Z-shaped park that stitches together three discrete sites. The projecta continuous green space with pedestrian pathwaystraverses both a road and a rail line in the course of connecting the city to its formerly industrial waterfront. In doing so, it successfully amalgamates diverse components into a unified, extraordinarily pleasing design, integrating the citys need for public open space and access to its waterfront with its continued infrastructure requirements. Any successful project addressing issues as complex as those involved in creating the Olympic Sculpture Park is the result of a well-choreographed effort involving a wide array of skills, not just those required for design, landscape planning, and engineering, but also those needed to build and realize the vision in practice.The Green Prize selection committee was particularly appreciative of the seamless manner in which Weiss/Manfredi worked with its distinguished array of collaborators to produce this extraordinary urban intervention.